Children with autism are far more likely than other kids to be overly selective about what they eat and why. Parents like you come to me seeking ways to get their kids to eat more. The advice you’re getting from doctors and other parents doesn’t make sense. Waiting doesn’t work when you’re worried about your child’s health. Especially when that child fears and outright refuses to eat new foods. In my autism nutrition program, I walk parents through how expand their child’s diet and reduce stress at mealtimes. Luckily, even without a feeding therapy or nutrition program, there are easy techniques you can use at home to help your child expand her diet. Limit eating times to 3 meals and 2-3 snacks every day and don’t allow anything but water between meals. Treat snacks as a formal meal, too. While the schedule may vary daily, stick to times that you determine. A schedule will train your child’s appetite and expectations. Or the counter. Consistently eating at a space that is reserved just for eating will reinforce the mealtime routine. Turn the TV off and keep any distractions (favorite toys, special foods) out of sight. Using a toy or activity to keep your child at the table takes the focus off of eating. Family members are big eating role models. Serve one meal the whole family can eat. Be sure to include something everyone likes, even if it’s just a side or a buttered roll. After the meal (or snack) is finished, the kitchen is closed. If your child doesn’t like the meal and chooses not to eat much, just remind him that the next meal or snack is coming in a few hours. Include your child in simple decisions like selecting which plate to use or choosing between two different fruits to have at snack. Participating in decision making helps your child feel involved. Cooking, playing with food, reading about food, talking about it - all of these activities benefit the sensory system and help picky kids feel more comfortable around new food. Do you know that means? Kids are more likely to eat. So take your kids shopping, let them help in the kitchen, make some food art, or plant a garden. 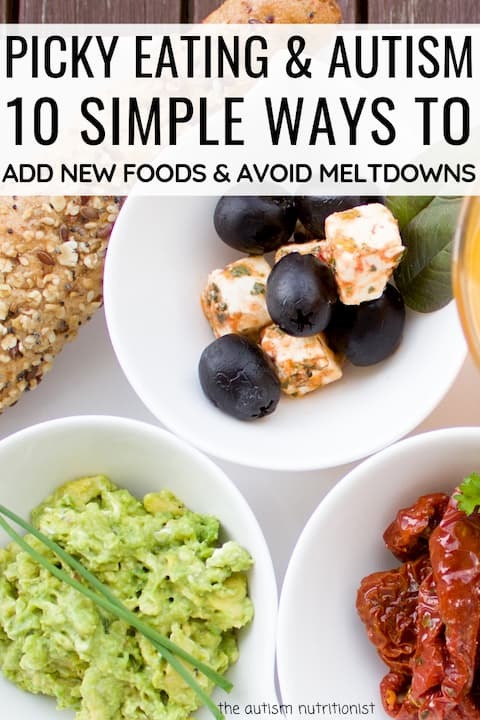 Serve one new food alongside at least one preferred food at every meal and snack. Offering a preferred food ensures that your child always has something to eat. Reinforce positive eating behavior with an immediate enthusiastic compliment. Ignore any behaviors you don’t want to see repeated. Variety is the spice of life. And the trick to keeping your child’s diet as diversified as possible. Rotate new foods, preferred foods, and cooking techniques, trying not to serve the same food two days in a row. Kids with autism are notorious for their eating problems and have less varied diets than their peers. Adjusting how you serve meals is a significant way to improve the diet of a picky eater with autism. Look at the list above and highlight the areas where you can improve. Begin implementing one tip every 2 days. 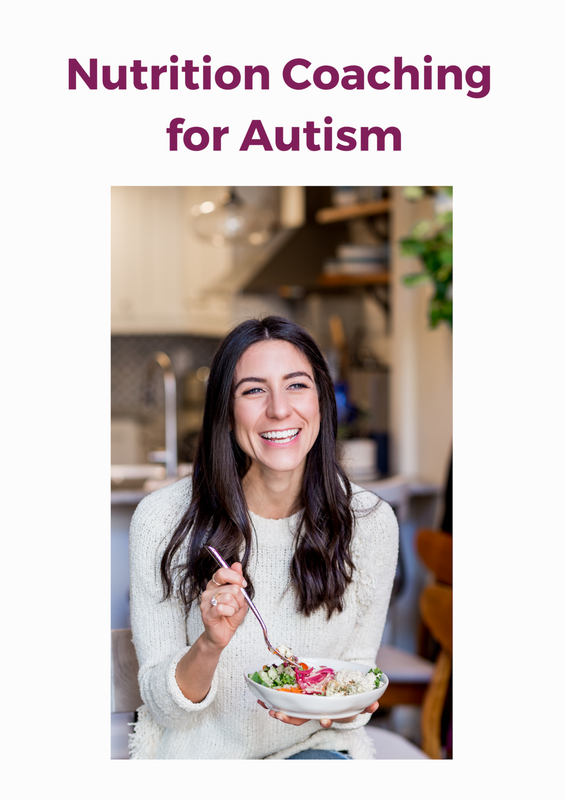 If you want an individualized approach to help your child try new foods without a meltdown, check out my autism nutrition coaching program. You can sign up for a free coaching call HERE.